After the highly successful mini-series, The Lost Room, Writer/Director, Christopher Leone, decided to develop one of his stories into a TV series. Parallels was that show and while it was very well received, the networks rejected it, because the premise of the show was too much like the show Sliders. I always thought Sliders had a bit too much comedy for what it was, and would be a much better show without it. Parallels not only did that, but it also modernized the story, and I think it would have been an amazing show, but the networks didn't agree. The story follows a brother and sister who are summoned to an abandoned building by their father. When they get there, they find strange writing all over the walls and are soon transported somewhere else. They come to learn that the building is a dimensional portal that takes them to different Earth's that can be slightly different or extremely different from our own. 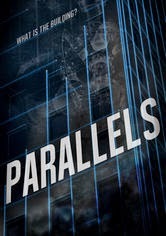 The pair search for their father only to find another traveler, who tells them, the building travels uncontrollably and they are stuck bouncing between parallel universes, unless they decide not to return to the building within 72 hours, in which case they are stuck wherever they've stopped. The story here is so deep and had so many different elements to it that I was in love within the first 20 minutes. Similar to the Lost Room, the story could have gone in a thousand different directions and was completely unpredictable. The cast is terrific as well, and is as diverse as the story itself. The only negative I have about this film, is that when it was finally decided that instead of a series it would be released as a film, the pilot wasn't change at all and nothing new was filmed. The movie should have been a synopsis of what the entire first season would have been, instead it was the just the first episode. The result is a lot of scenes that were too long for such a short movie, and a whole bunch of unanswered questions, that may never be answered. If I learned anything from Parallels, it's that similar doesn't mean the same, just like the different Earth's they travel to, Parallels is similar to Sliders, but it's not the same show, in fact, I think it would have been a whole lot better.